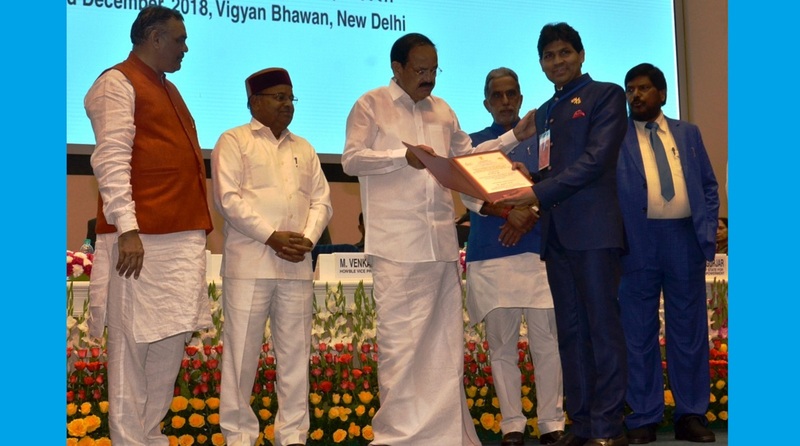 Dr Yogesh Dube, selected as the Best Individual Working for the causes of Persons with Disabilities by the Ministry of Social Justice & Empowerment, Government of India, has been conferred the highest National Award for the Empowerment of Persons with Disabilities, 2018. This highest award in this ﬁeld is given every year by the Ministry of Social Justice and Empowerment to individuals working for the beneﬁt of the disabled citizens. Dr Yogesh Dube received the award for his altruistic services over the past two decades through educational facilities, vocational training, skill development, job opportunities for the disabled. He has also launched an Aadhar Linked divyang friendly Mobile App “Divyang Connect.” Dr Dube has provided assistance to numerous Divyangs by way of mobility aids, prosthesis, medicines, and assistance with government schemes etc. and has also organised exhibitions for the Divyangs on job opportunities. He has assisted in rehabilitating people afﬂicted by Japanese Encephalitis (JE) / Acute Encephalitis Syndrome (AES) which has resulted in their being disabled. He has also ﬁled petitions with the NHRC & MSHRC for divyang-friendly infrastructure in public utility buildings in Mumbai & other cities of Maharashtra and has taken up their cause for seamless travel with the Airport Authorities and Railways and other Government departments for the beneﬁt of the divyangs through policy interventions and implementation by the government, local bodies, and other organisations. Dr Dube looks after the welfare of special children through the Vision Institute for Special Children and is also involved with the National Association of the Blind and guides the Being Patient Foundation which works with burn and acid patients. Dr Dube launched the national burns awareness programme organised by Gujarat Plastic Surgeons Association and AMA to make India burns free by 2025. Dr Yogesh Dube has also received the National Youth Award from the Government of India. Dr Dube has been honoured by several national and international institutions, societies, trusts, groups, and organisations for his varied contributions for the good of society and the divyangjans.